The issue of race was raised before the Cuban Parliament for the first time in November 20, 2011, when UNEAC’s Aponte Commission presented the “Report on the Racial Problem in Cuba” to the members of Education Committee. Participating in that debate were Abel Prieto, Miguel Barnet, Zuleica Romay, Mariela Castro, Ricardo Alarcon, Heriberto Feraudy and others. Currently (December 2012), the second step took place, the fruit of the previous one. This more recent period has been characterized by the strengthening of efforts around this issue using all of the tools necessary for the battles to be waged. However solutions to these real problems will not solely emerge through the presentation and discussion about discrimination in Cuba’s Parliament. Now more than ever, Cuban citizens and all of society have the opportunity to participate as well to articulate their own effective strategies in the educational, cultural and civic orders and wherever people are discriminated against – whether or not this is at the center of the public’s attention. Discrimination in all of its manifestations is reprehensible, therefore to preclude even the smallest space for its propagation, it is necessary that intelligence remain a part of the new culture in social communications, culture and education. This issue must also be raised in schools, since there is a need to infuse it into our culture and science, and to broadcast information about discrimination over the media. Otherwise the social mechanism we possess for eliminating racism will not function. A society based on a socialist system of production shouldn’t retain vestiges of racism, though these continue to be reflected at the level of the general public. The influence of racism in our country after the revolution has decreased significantly, but there remains much political and ideological work to be done. How is it possible that in the tourism sector, or in the hard-currency system of stores, the numbers of black and mestizo workers continues to be so small, especially in managerial positions. This is why it’s easy to appreciate the danger of racism being resurrected in the superstructure of Cuban social conscience. This is why it’s so positive that parliament — for once and for all — is tackling this issue. It is the most important of all the problems of Cuban society because, in addition to the economic crisis and its derivative issues, this is an issue that belongs to all of us as a nation. Therefore we have to take it to the street and to the people for it to be thoroughly understood and relentlessly discussed. Some of us have been waiting for this moment for a long time. But let’s not delude ourselves, we were not able to erase away nearly 500 years in only the last 50. Although we stumbled along, not without mistakes, we also made progress. Now we are finally knocking at the doors – ones which, I at least, consider secure. The issue of race was finally discussed — twice — in the Education Committee of our Parliament, and I hope that next year it will be raised in the full plenary session of the National Assembly to occupy its rightful place. In this way it can be discussed by all members so that specific policies can come out of this body for their application as solutions. This involves an acknowledgement that many of us have been waited on for years. We have struggled, never losing hope, trusting that justice would break through provided we were willing to obtain it at whatever the price. This did not involve a debt from the more than 50 years of the revolution, because no other country in this hemisphere has done as much for blacks and mestizos. No nation has fought so hard against ignorance, discrimination of all kinds and inequality – to the very edges of egalitarianism. Nevertheless, if there is a debt it is to history in the formation of the nation, its culture and identity. To explicitly recognize that the issue exists and should be discussed nationally is an achievement that reassures many citizens and pays honor to our ancestors, whatever color they might have been, because this means advancing in the salvation of our national and cultural identity. Without that rescue, the nation, Cuban culture and identity would be incomplete. Therefore we’re not fighting simply to add color to the land we inhabit and its institutions; we are not fighting only for the equality of all, but to be able to put into the hearts of all Cubans their rightful color, “the color of Cuba,” to quote our national poet, Nicolas Guillen. This is because not everyone is in the position they merit, especially those who were brought from Africa against their will, uprooted, transplanted abruptly from their land, with no families, no wealth, no names – although here they proudly became Cubans and many fought for this land. They hold no hatred, no bitterness, only the pain of not having been able to feel the same or to receive the fruits of their sacrifice. Though slavery was abolished, the pain of their injuries remains today. It is here in the heart of many Cubans of all colors. A demagogic post independence slogan proclaimed: “All Cubans are equal,” a cynical manner of hiding inequality. It was an immense lie that blocked us from truly understanding when was the moment for the consolidation of our nationality, our culture and identity. This occurred in a society in which poverty was also massively white, but wealth was never black. In addition there was all of the discrimination that attacked us for centuries. I’m sure our “taitas” (elders) are smiling down from wherever they are, because it has been openly acknowledged that we still have a long way to go on the road to equality, equity and the elimination of discrimination in this country for which so many have fought, died and are still struggling. To me it seems that the treatment of the subject in the National Assembly has been very positive by allowing for the possibility of specifying discrimination, from a legal point of view, so that the violations of the provisions relating to such a sensitive issue can be made public, prevented and penalized if necessary, although it is not principally a legal battle that must be waged. Despite the fact that in Cuba “whoever doesn’t have Carabali [African] blood has Congolese blood,” there persist attitudes and actions that demonstrate some elements of racial superiority among some of us that the great work toward social justice by our revolution could not stop. Not everything will be corrected with laws. We must continue working to raise consciousness in all areas of our society. The worst would be to silence this effort and to continue claiming that racism and other forms of discrimination are things of capitalism or simply elements of the past. No, these are still here, and not only as old luggage but also as the result of imperfections and dysfunctions of our society. The model has yet to be perfected. Unfortunately, the most formidable challenge we face regarding the issue of race is unawareness and ignorance (be it voluntary or involuntary), and the absence of racial consciousness that we all still suffer in trying to understand that we are facing a problem that is not simply black, white or mestizo, but of all Cubans. We are faced with a social dysfunction that persistently prevents us from recognizing ourselves and taking ourselves for what we are: the fruit of a “multiracial,” multicolored society that requires us to consolidate our social system. Without this, Cuban society will fall back into the hands of our ancestral colonizers. In societies like Cuba, consolidating the social project of equality, equity and solidarity is an essential condition for maintaining independence and political sovereignty of the country for which so many fought and died. But there still exist not only racists but various manifestations of racism in Cuba. One example of this is the discrimination practiced by many of the supposedly “pure” residents of the capital. They direct this against other Cubans who come from other regions, especially from the east, or don’t have in their blood the “Aryan” purity of the Havanan cultural elite. They pejoratively call them “Palestinians” or “landless” people, as if these individuals do not hold the honors they have earned for struggling to win their rights. How is it possible that in the tourism sector, or in the hard-currency system of stores, the numbers of black and mestizo workers continues to be so small, especially in managerial positions. It would be absurd to hold anything against Havana residents as a whole. I think most of them are as hospitable, fair and as patriotic as other Cubans, but I do hold something against those who maintain illusions that do not correspond to our social system and have caused so much damage. I’m thankful for the self-admission that we are not perfect and for putting on the table those problems that we must face and solve together. I understand that discrimination (of any kind) is a disease that seriously affects Cuban society. I believe that Cuba is one of the countries that has made the greatest progress in this sense, meaning that discrimination here is displayed to a lesser degree. I have seen how mestizos, blacks, whites, women, homosexuals, religious believers, etc. share the same rights and social obligations. But as Cubans, what caught my attention for many years was the xenophobia that reigned throughout the country, when foreigners had certain opportunities that nationals didn’t have access to – even when they had the resources. Similarly, treatment in institutions that provided services was different for nationals and foreigners. It was a manner of discriminating against us ourselves. These “barriers” were removed, but they are still in the subconscious of people. It seems to me that something similar happens with other manifestations of discrimination. Since the triumph of the revolution everyone has enjoyed equal rights, responsibilities and aspirations; it is only that a group of the population still lags, those who inherited the inequality that was built for generations and years, fostered by the system of capitalism under which we lived for an extended period and that still refuses to disappear… This exists though I don’t think that discrimination is a trait that characterizes our people. With the impending economic changes, as necessary as they are, inequality is expected to return, threatening equality and equity between all Cubans. On the other hand, what I do not share in any way is the view that we obligate public offices to be increasingly occupied by women, mestizos, religious believers, etc. These are positions that must be earned with concrete results in the respective areas, with experience and a great deal of training and preparation. Drinking a glass of sugar cane “guarapo” juice. These positions should be occupied by those citizens possessing the skills and knowledge specific for playing the particular role, regardless of their language, sexual orientation, color or any other aspect that can be discriminated against. Those positions must be held by those who can really lead us, while maintaining our principles. Even when policies must be adopted, these must not privilege any racial group but serve to balance differences. Relatedly, before these measures are taken, there must be an evaluation, because the starting points for all Cubans are not equal. This is a gradual process, I know. You can’t change the thinking of people in such a short time, but five years have already passed since the issue began to be addressed more openly, in 2007. There should also be a review of our educational programs from elementary, junior and senior high school. We must strip away all the prejudices these retain. The training and preparation of teachers in these subjects should also be improved, because if they are not aware and are full of prejudices, just like families, (of course there are exceptions) who is going to educate our children and adolescents? They themselves? That could be one method, but if they don’t have the support of adults, it is all in vain. Jose Marti wants (yes, here in the present) that our constitution be a tribute of Cubans to the full dignity of the human being. Therefore we have to make sure this is not just a slogan, but a reality once and for all. If we want to achieve something, we need to start from the earliest age and ensure that a law is passed in parliament that officially and lawfully recognizes those rights. This would help a lot, though it would not be the solution. The institutions of civil society and the Cuban government, their projects and policies that are demonstrated in socialist Cuba, represent a crucial step forward toward participatory democracy, with citizens as protagonists and the hopeful recognition of a positive racial identity. Nevertheless, what’s not clear is the analytic relationship between the policies and development strategies aimed at discrimination based on culture and the resulting material discrimination reflected in the unequal attainment of quality education, employment and housing. How do, for example, the new economic policies reflect and address the differences in standards of living with regard to racial inequality, including differences in remittances? These situations must be addressed. Again, it seems that the treatment of the issue in the National Assembly has been very positive. School kids during physical education. Specifically, the color of someone’s skin is something impossible to ignore. It has marked all of us, especially those who did not come seeking fortune and privilege, and even more by those who gave their blood and sweat, aboard slave ships, in the sugarcane fields and mines, as mere servants, in the stocks and in anonymity while creating a great part of the wealth we have today and for which they were never recognized. For the happiness and hopes of everyone, we have definitively begun to remove “the scab of colonialism” that has affected our culture, nation and our identity. Now we are going to be Cubans like we never could before. The country must be filled with plaques, monuments and history museums that unequivocally recall all those who sacrificed themselves in the struggle for us to be one people. This will contribute to a feeling of recognition and purpose on the part of those who wish to accompany us in this battle against all forms of discrimination. 1. Written Cuban history still gives a fairly insufficient reflection of the role of blacks and mestizos (particularly black women) in the process of the building of the nation and its culture, a deficiency that affects our cultural and national identity when seen as a whole. This implies a significant change in what is taught, both in textbooks and in the methodology for conveying this information. 2. There exist manifestations of racism, which are expressed as the exclusion of blacks and mestizos (especially the former) from some social and economic settings. This is a situation that we must continue to fight in a more open, multilateral and systematic manner. This implies a great deal of work with the agencies of the national government. 3. Ignorance and insufficient culture awareness are present in many of our people. These are individuals who avoid the issue of race, deny its existence, assume the most varied attitudes with respect to it, or simply believe that race is something not worth talking about. All of this implies major cultural and outreach efforts. 4. 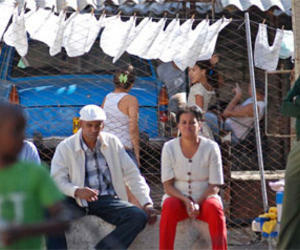 A new economy emerged in Cuba during the so-called “Special Period” as a result of the set of measures to overcome that economic crisis. It is based on the emergence of joint-venture (national and foreign owned) corporations, tourism and more of a market approach to the economy. However, it is still exceedingly exclusive in terms of the presence of blacks and mestizos in leading positions within it, especially in activities relating to tourism and managerial roles. Every effort must be made to balance the presence of blacks and mestizos in this new economy. 5. The principles outlined by the country’s leaders to achieve racial balance in general leadership (a policy established in 1985) have still not been achieved. The limited presence of cadre — especially blacks, but also mestizos — in the leadership structures of the government and enterprises (particularly within corporations and tourism) is alarming. This contradicts the high educational levels attained by those racial groups. We must act in pursuance of those principles that were outlined a while ago but were not followed. 6. Cuban education, for its part, has still not dealt with the issue of skin color as part of the scientific, cultural and political-historical instruction of students. In the current social situation, our youth are still confronted with negative stereotypes (about blacks and “non-whites” in general), racial prejudice, discrimination and racism. With regard to the issue of race, there remains a deep dichotomy in Cuba between school and social life, which affects the cultural and political development of young people mainly. This evidences the need to articulate the presence of people of color in education, science and the national media. This should also be done in such a way as to generate a feedback mechanism with respect to race. 7. In classrooms, blacks, whites and mestizos do not feel as if they are receiving content that everyone would assume in an equalitarian, coherent and balanced manner as members of a mono-ethnic and multicolored society. 8. People’s skin color doesn’t openly appear as a direct variable in the determination of social policy. However this policy — though it attacks poverty, social injustice and inequality in a more specific and direct manner and “discreetly” practices so-called Affirmative Action — still does not address the essence of differences, which are engendered from different historical starting points and subsist among racial groups that make up the current Cuban population: whites, blacks and mestizos. 9. The social sciences and humanities, particularly in higher education, have still not sufficiently taken up the issue of race as something whose study and research is vital for a deeper understanding of Cuban society and is the required approach for its improvement. Therefore teaching and research that have developed in our schools and colleges are inadequate when viewed from that perspective. 10. Public discourse in which discrimination is attacked is still not sufficiently disseminated; there are also certain aspects present that should be amplified. Despite this, its formulations have important inherent ethical foundations for discussing the issue of race. 11. A considerable part of our intelligentsia doesn’t even mention the issue of race, as they do not see it as a problem that must be solved. This is why it’s possible to say that there exist important differences, even among our intellectuals, as to when will be the consolidation of the Cuban nation and the culture in which we live. 12. Up until now, our economic and social statistics virtually ignored “skin color.” Consequently, it’s possible to question the scientific validity of the conclusions since analysis has excluded a key variable for the characterization of the Cuban population. This is the reason why opportunities have been missed on numerous occasions for reflecting the true social mission of the revolution. This will not be achieved if our statistics do not include skin color with all of the other socioeconomic, cultural and political variables. It’s not enough to say there is a percentage of unemployment; we need to say what color it is and where it can be found geographically in order to see it concretely as physical individuals. An example of this absence can be seen in various reports issued by the Cuban government in recent years: “Research on Human Development and Equity in Cuba, 1999,” ICES-UNDP, Havana, 2000; “A Statistical Profile of Cuban Women at the Turn of the Century,” the National Office of Statistics (ONE), Havana, 1999; “Cuba: 10 years after the International Conference on Population and Development,” CEPDE-ONE-UNFPA, Havana, 2005; “Cuba: Millennium Development Goals,” Second Report, INIE, Havana, July 2005.